A phase-contrast scan of the mummy’s hand. Nine individual scans were stitched together to create this composite image. A revved-up version of traditional CT scanning shows it’s possible to acquire microscopic-scale images of ancient Egyptian mummies, revealing previously unseen features such as blood vessels and nerves. Non-destructive x-ray and CT scans are a boon to medical scientists and healthcare practitioners, but they’re also an indispensable tool for archaeologists who try not to disturb ancient remains any more than they have to. When it comes to studying ancient mummies, these scanning techniques have been used to sketch the rough outlines of soft tissue and hair, and even to reveal interior features such as muscles and bones. A new proof-of-concept study published this week in Radiology shows a modified version of CT scanning, called phase-contrast CT scanning, can be used to do microscopic-scale imaging of soft-tissue in human mummies. This imaging technique detects the absorption and phase shift (similar to how light changes direction when it passes through a lens) that happens when x-rays pass through a solid object. The resulting images feature a higher level of contrast than traditional x-ray images. (a) Top and bottom views of the mummified hand; (b) A schematic of the experimental arrangement shows microfocus x-ray source, sample placed on rotation stage, and x-ray detector. This method, which has been around for about 10 years, is particularly good at capturing the high contrast needed to visualize soft tissues, but up until now it’s only been used in medicine to scan the insides of such things as livers, hearts, and veins. For the new study, Jenny Romell and her colleagues at the KTH Royal Institute of Technology in Sweden wanted to evaluate the effectiveness of using phase-contrast CT scanning on mummies. The researchers scanned a mummified human right hand from ancient Egypt. The hand was lent to them by the Museum of Mediterranean and Near Eastern Antiquities, and it dates back to around 400 BC. 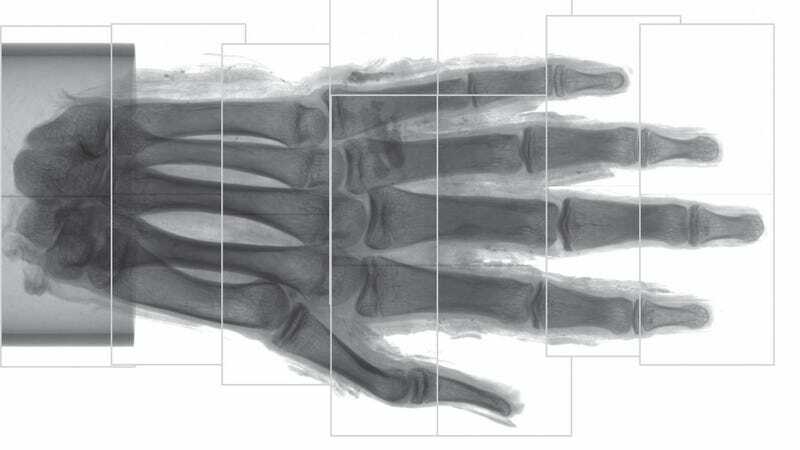 Rommel’s team scanned the entire hand, followed by more detailed imaging of a finger tip. (a) top view of the skeletal hand; (b) cross-sections of the hand showing interior detail. The system worked beautifully. The resolution got as good as an estimated 6 to 9 microns, which is slightly more than the width of a human blood cell. At such a small scale, the researchers could visualize the mummy’s blood vessels, different layers of skin growth, adipose cells, blood vessels, and nerves. For archaeologists, this now introduces a new way of imaging ancient remains in an unobtrusive and highly detailed way. It’s very cool, and we’re looking forward to seeing where archaeologists take this. Suddenly, all those dusty mummies on display at museums around the world are new again.